If you are on a gluten-free diet, or you have celiac disease, you know that reading cookbooks, cooking magazines or anything of the sort can be tough. It’s no fun looking at pictures of beautiful, delicious food that you can’t eat! Enter Easy Eats, the newest digital food magazine to hit the web. At first glance, the cover that features delectable glazed doughnuts scattered with rainbow sprinkles might have gluten-free eaters running for the hills. However, the tagline will, without a doubt, pull them back in: "It’s good to be gluten free." Editor-In-Chief Slivana Nardone, whose most recent gig was Editor-In-Chief of Rachael Ray magazine, decided to create the online magazine after her children were both diagnosed with gluten and dairy intolerance. As a cookbook writer, former bakery owner, and food lover, she created Easy Eats to prove to her children (and everyone else) that it’s good to be gluten free! As Slivana says "My intentions all originate from the same place: positivity. 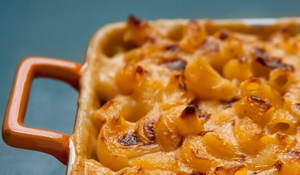 Yes, you can eat mac and cheese. Yes, I will make cupcakes for your school birthday party." Even if you’re not gluten-free, the digital pages of this magazine will have you excited to try out alternative, gluten-free baking and cooking methods. The latest September/October issue features delicious recipes such as four, crowd-pleasing cupcakes – vanilla, chocolate, apple and strawberry (page 21), and our personal favorite, the creamy Mac & Cheese (Page 36) that tastes anything but gluten-free and low fat! Slivana, also includes a special section that features kid-friendly recipes that she makes in her own kitchen for her family. Your kids are sure to love her original and fun meals including Cracker-Crusted Sloppy Joe Pie (page 71) or Fried Chicken Potpie Poppers (page 73). And the best part? The magazine provides an illustrated recipe index at the end of the magazine, so you can easily find the recipe and pull it up on your iPad or laptop in the kitchen when it’s time to cook! But recipes aren’t the only thing that Easy Eats has to offer. The magazine also provides a plethora of gluten-free product information and healthy living features, as well. Wondering which gluten-free brand makes the best cinnamon raisin bread? Easy Eats recommends Rudi’s (page 27)! Are you are interested in staying healthy this fall by eating whole foods? Check out Nature’s Pharmacy (page 12). Or maybe you are looking for something to calm your mind and keep your digestion healthy as we move into the holiday season? Julia Dohrman’s yoga guide (starting on page 39) will help you relax. Overall, Easy Eats is a great gluten-free resource, and we think it even rivals Everyday Food and Bon Appétit as a great food magazine! We can’t wait for the Holiday Issue that promises 150 pages of festive recipes to be released early next month!